This is called The Instinct Java Developer Contest. Actually, the first prize is $20K + up to $5K as free membership (?!) in the developer’s program. Details are here. This sweet deal was backed by Sprint that’s promotes Samsung’s Instinct phone. I can’t recall AT&T offering money to develop programs for iPhone. But that’s fine – iPhone has been closed for developers till this Spring. Not that I need those bloody $20K + up to $5K as free membership, but it got me interested – I wanted to look at the phone. Apparently Sprint needs some help not only with Java programming, but they need Flash developers too, and they need them badly. Sprint’s Web page contains the link to their preview Web page of Samsung Instinct. I clicked on that link, and the process of downloading SWF for Flash Player successfully started. I’ve been watching percentages 43% …44%…45% for about minute(!) to see the main page with the menu. Yes, my Internet connection was slow at that time – 350Kbps for downloads. But there is lot and lots of people who are sitting by the slow wires. Decided to do a little more research – this site downloads about 2.5MB worth of files just to show the first page. No wonder it’s slow. Then, I clicked on the menu item About The Phone. This menu Item returned back several thumbnail images, which was yet another menu. This time I was watching the message “Buffering” for yet another minute. This is a good example of bad RIA practice. Developing Intranet applications for the users sitting behind the bars within the confines of the enterprise at 20-30Mbps is easy. But this is not an Intranet, this is consumer facing application, which is completely different ball game. People do have slow Internet, and you don’t want to lose them – they can be potential customers of your business. For comparison, visit the original Samsung Instinct page. It’s blazingly fast, but it’s not RIA. But it’s blazingly fast. I just got off the project where I was helping with design and development of a large and fancy consumer RIA Web site for a major car manufacturer. This site was created with Adobe Flex with lots of nice effects and animations too. We spent some time to re-factor and fine tune the code and were able to bring the size of the initial Web page from 4MB to 1MB. The speed of the first Web page appearance is crucial for RIA. One of the chapters of our upcoming book “Enterprise Flex. Best Practices” is called “Performance Considerations”. In this chapter we’ll talk about actual vs. perceived performance improvements and various techniques of dividing the project into a set of loosely coupled modules and libraries, which besides minimizing the size of the downloadable code chunks helps in splitting the work between different developers working on the project. Coming back to that phone Web page… I watched a 30-sec commercial showed Instinct and iPhone side by side. 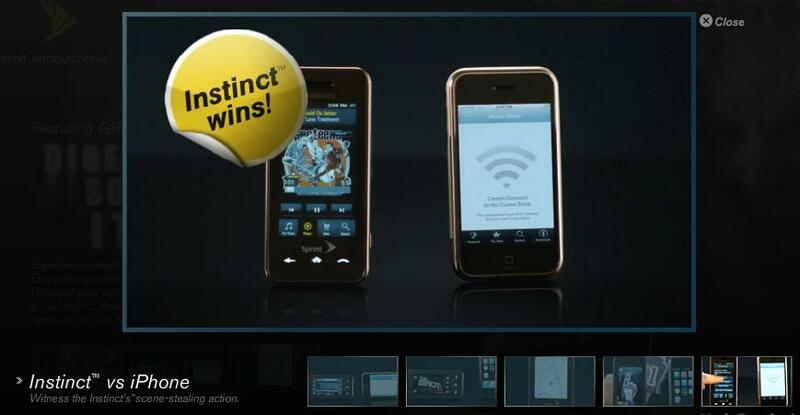 The message on the iPhone reads “Cannot Connect”, then surprised voice asks, “Cannot connect?” This video ends with the “Instinct wins!” screen. I believe that many people will become irritated while trying to learn about Samsung Instinct via this Sprint Web page. This site is a great example of how to damage a product by engaging rookie RIA developers and screenplay writers. If Sprint had some political reasons of sabotaging Samsung Instinct sales, they did a great job.